Microsoft please listen 🙏 You are making your products look bad on the iOS platform Your new icons may look nice on paper and when looked at on the app store, But your icons were very colorful, and I used to put them on my main home screen on the iphone & ipad. Now with all their whiteness surrounding, the look bad, especially one next to the other, on dark backgrounds. At least give the option for an invert version of the background. ios has support for user selection if icons from a list be nice and help with that and let us choose. Now I’m hiding all your apps in a folder in some distant screen, so I won’t see them until I need the apps 🤷🏻‍♂️ Please consider! Lol epic 🤣🤣 totally worth the update. I love the app! It’s easy to use and had great functionality. The last update has a bug that doesn’t automatically lock the app upon exit when Face ID is turned on. When re-opening the app, the prompt for Face ID don’t pop up and the app is unlocked. I hope this is fixed ASAP! The new icon is great. I hate it when icons stay the same forever. Nice work! Embrace change! I use both OneDrive Biz and Personal and it’s shocking the developer of File Explorer (MS) has provided such a low quality product. I struggle daily with the these issues at a minimum: 1. Why is it assumed we want tile views of files and folders? When we select detail why doesn’t it remain permanent and apply to all downlevel folders/files. 2. File extensions are important; why can’t we see them? 3. Dates don’t display the year, even for prior year dates. 4. File properties fails to display the FULL folder path. It only provides the last folder in the path to which the file resides. 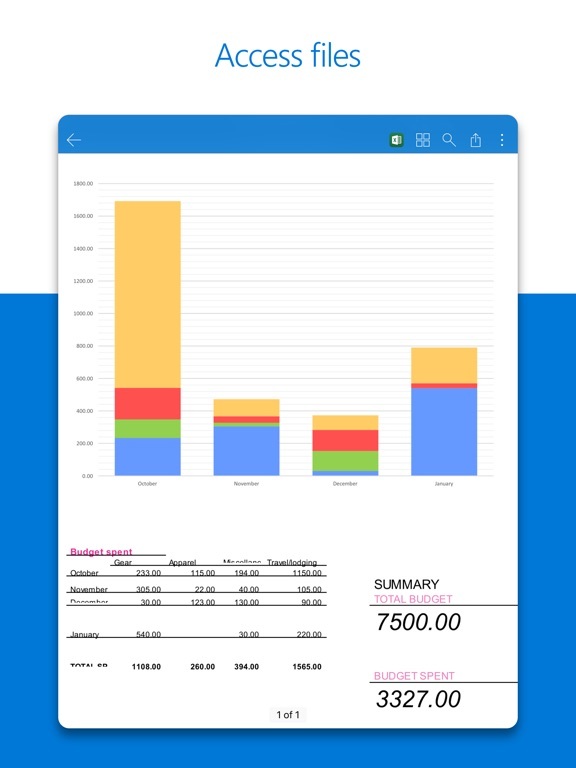 Consider this example: 2018\Plan\Expenses\file.xls 2019\Plan\Expenses\file.xls When viewing file properties for a searched file, the properties view will only display “Expenses\file.xls”. Because the full path is missing there’s no way to determine file content without opening the file. Huge oversight. 5. 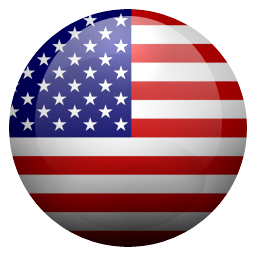 Boolean search: Search is a disaster. Not only is it undocumented, it is unreliable. The same file path issue exists as above. 6. 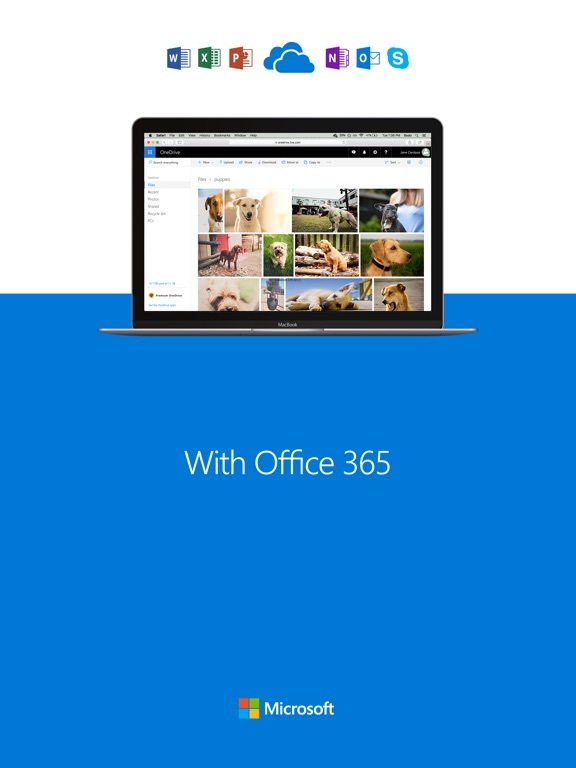 We’re stuck with OneDrive because of its interdependency with O365. Online file saving and third party search tools are the only solution to these pathetic oversights. I don’t know who had the idea for the new icons across all the Office platform apps. There must have been a sale on white! The icons are ugly in the extreme!!! ***update*** Nice! Thanks for adding that. OneDrive is awesome so glad to have it functioning on all platforms! ***old review*** This stupid thing pops up every two seconds. Forget using it on an iPad or iPhone on a commuter train or bus or couch with kids. Please make it stop! 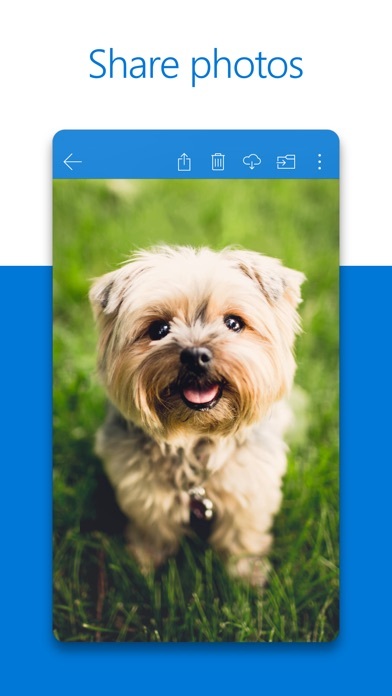 OneDrive mobile apps make no distinction between image files in your camera roll, and image files anywhere else in your cloud storage. This means your photo view will contain it all. Sync some of your design tool settings, and every texture file - every one - will dump into your OneDrive photo view like so much digital diarrhea. There is no way to disable this behavior on either iOS or Android. I would switch to this subscription in a heartbeat but this terrible design is a deal breaker. Got a new iPhone and downloaded all my apps from the backup. Since then Onedrive started uploading each new picture that I take. The settings are off for camera uploads, but for some reason it continues to do it. Not sure if this is caused by a recent update to OneDrive or in incompatibility with the iPhone XS Max. But it’s really annoying. It won’t upload all of my photos automatically. If I close the app or the phone goes to sleep it stops uploading. I have emailed support about it and not gotten a response. I don’t know why I’m paying for a subscription for this! I read many articles and highlight text as I read. This app is wonderful for allowing me to do so, but it is very unstable and often will freeze and load, then scroll to the top. I have to scroll down to find my place to continue reading and highlighting as I go. Please fix these stability issues. Thanks! At most times when I erase an entry on a pdf it erases all of the entries I have made. This causes a waste of time going back and re entering data. The program also stores ghost files which can not be opened or deleted requiring the entire folder to be deleted. I want to give zero star if I can! Is it so hard to implement a function to search in recycle bin? I cannot search in recycle bin in PC, Android, iPad, Web. Stupid. I cannot get to my files. Every time I ask for my file One drive asks me to sign in again over and over again. Tap an Excel file with previews enabled. It sometimes opens the preview and sometimes wants me to install Excel (or opens it if it’s already installed). Really needs work in TIMELY syncing of photo uploads. So I was trying to upload a video so I download OneDrive and tried to login but it said I couldn’t log in and that was my outlook account then I try my phone number and it still doesn’t work honestly just delete the app. 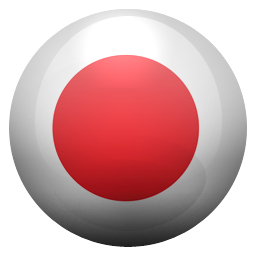 Great app I use for Xbox, files, work, my business and a lot!! Recommend!! Being a photographer I need a reliable, secure place to save my pictures and the best thing about one drive is that I can open it from anywhere and share links to clients, family, friends. Really great app. Areas where it is still annoyingly MICROSOFT: 1) When you hit the share button it wants to share a link. STOP PRESUMING I WANT TO SHARE A LINK! 2) It does not allow you to default to a list view. You have to change each window manually. Even when you do, when you click into a folder it is back to a tile view. Come on! 3) cant share multiple files as an attachment easily. Best way is to use the iPhone files app to access Onedrive and do it. Again, Apple has to make an interface for MICROSOFT and it works align to how users actually work. These three things are so heavily used as part of a file management app that they overshadow the rest. If these were fixed (read blogs, it’s a major complaint) then its a 5/5. This is the best use, or source I know! Most of the functionality of this app is great, but the PDF markup feature is all but useless, specifically the pen/ink tool. As a business professional moving towards a digital workflow, that renders this app all but useless on iOS devices. 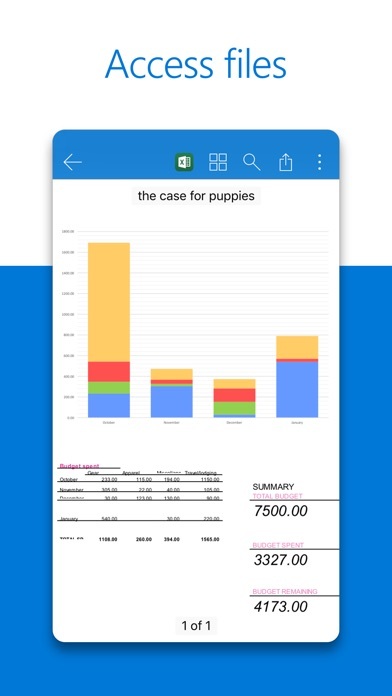 Very useful app to organize your documents and use it anywhere u want! U can upload the whole folder unlike other apps only u can uplode files! Easy access! It helped me alot of my college work And for job also. Pdf forms AirPrint with the shaded form fields in the print out. Forms do not natively print in this fashion and therefore you have to use another app to view and print the form. Might as well not even use one drive to store pdf’s. I love this app! The only thing that I dislike is not being able to link more than one personal account like in Outlook. You have to sign out of one to log into the other. You pay $6.99 for 1GB, but can up it to $9.99 for 5GB. THEN they tell you that you are only allowed 1GB PER DEVICE, you do not actually get 5GB . So then you have to split everything up to get what you pay for, which is a royal pain and NOT what I wanted. STOP ERASING MY DAMNED DOCUMENTS!!! Now you say I have 1TB but you ERASE MY DOCUMENTS!!! YOU SAY I ONLY HAVE 5.5% of 1 TB used!!! But yiu ERASE MY DCUMENTS!!! STOP ERASING MY WORK!!! The OneDrive app is one of my most used app. I am a doctoral student who reads a lot of papers and this is a good place to store and read research articles with my university drive. The recent update took out the feature which enabled me to highlight scanned text and now is looking for web based PDFs instead. I request one drive that ability to use highlighter in scanned text makes this iPad app more than just a storage drive but a reading one as well. I would like to see that feature again, until then I guess have to move my work to Apple Books. where’s the icon update for this? Looks out of place next to the new Office icons. Same can be said for Office Lens. I’m not asking for much here. MS is a premiere product line. If your like me and your always on the go then this App is for you! When I’m traveling I don’t always have time to pull out my laptop. The One Drive App allows me to transfer and access all my documents across all my devices at anytime. I am having an issue with this app on iPad and actually also on android. Files are not syncing properly and you end up with duplicate files or folders and sub folders. Quite annoying as clearing cache or refreshing doesn’t fix the issue. I end up to have to reinstall the app on my iPad. I never have this issue with Dropbox that is still better in this area. I want to be able to edit things stored in one drive, but no way I can. I want it to know what kind of file it is, and open a word doc in word, or excel in excel, from one drive. For some reason OneDrive decided to store every single picture it could off my phone even though I have all of my photos in ICloud. This feature had to of snuck in from an update. This is why I hate Microsoft. Needs to be fixed! ASAP! 2019.04.13 Seriously, one can’t copy a file without going through some tortuous routing. Microsoft - you have so much room for improvement. 2019.01.16 Update I can still not get PDFs to annotate. Renders this app useless to me. Please fix. 2018.12.18 update Although this update is supposed to improve the PDF annotation I am still not getting the toolbar to perform annotations. What gives MS? Still can't improve my rating. 2018.11.18 update So no ability to edit as in previous versions. Multiple comments made but no response. I even went through the app and received a glib "thank you fro brining this to our attention." response. Now how about fixing the problem?!?! 2018.11.10 update Continuing to get worse. I used to be able to edit PDFs in this app. This new down date has destroyed this app. I am not the only person who has commented on this. HORRIBLE!!! Useless!!! Needs to be fixed. July 27 MICROSOFT YOU NEED TO FIX THIS NOW. I have many files in my one drive including folders with PowerPoint, VTS, etc. It is not allowing me to click on the folder and download all the files but rather is making me select each file independently and sequentially (it will only download one file at a time) to down load the files to my hard drive. I spend way too much time in areas with poor streaming capabilities to not have hard copies on my iPad. In addition some files don't have a download option. One must select the "open in another app" to have it down load. A huge waste of time and a huge FAIL ( yes, a four letter word that begins with "F"). MICROSOFT YOU NEED TO FIX THIS. NOW. Very handy to hold all my files and pictures. Easy to navigate and manage. I teach for three different schools, each of which pays for a terabyte of OneDrive storage. If I could connect any one of those accounts to my personal account, this would be a five star app. Instead, MS wants me to pay for a fourth terabyte while leaving the other three unused. I understand the business model, but I don’t like it. The app itself is decent, but the integration with the Files app is poor. Beware, if you save a PDF from Safari, it won’t work properly and you won’t be able to access it. 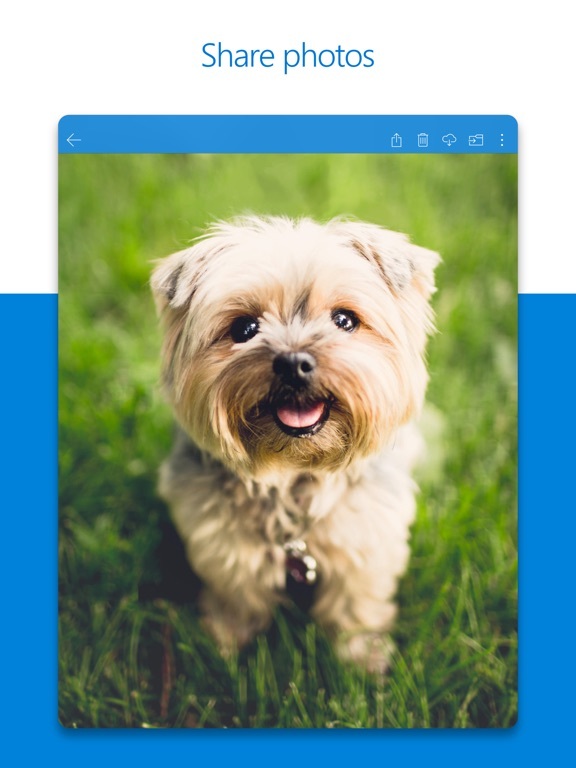 Without the ability to lock the OneDrive on the desktop, the drive is almost useless for people who want to keep their files under password protection. I know that the drive can be locked on the iPhone, but that is not adequate. The only reason I downloaded this was to transfer a video file from my pc to my phone. When the video gets to my phone, the audio is gone. I’ve deleted and reinstalled the app and I restarted my phone. This isn’t necessary. If this is a mistake, it should be fixed. A headache every time I’m forced to use it! I can keep all of my documents nice and organized. I even scan in paper documents! My environment is mixed. We use PC and Mac and iOS. OneDrive works seamlessly across the board. I really enjoy the service being bundled with O365, I use it as part of my work and personal life. Although the IOS app still has a few bugs that should be fixed be at a 5 star level. THe main one is the integration with the IOS files app, has room to improve. There should be a way to see if the file is actually copying on crashed and possibility to manage offline files (similar to what Box does). On the app itself, I would rather it wouldn’t ask me everytime I want to drag a file to a folder if I really want to do it. When paired with an O365 subscription, the value you get is just incredible. All your Windows computer docs and iOS photos in one place, as well as full access to MS software suite on both devices. And I appreciate the consistent improvements MS had made with this app, it’s come a long way. Enjoy the occasional notices for weekend recap and on-this-day memories. Always there when I need it on all my devices. I have been attempting to cancel a free trial period of One Drive ever since the second or third day of the thirty day trial. These people do NOT respond. SO frustrating. This will no doubt be a huge pain in my backside getting my bank to stop them taking money from my account. A word document I saved onto OneDrive from my laptop, I can no longer see on my iPad when I open my OneDrive app there. It was working okay for some time but no longer. What gives? OneDrive is very reliable, but would like to be able to drop scanned documents to another folder on my Onedrive. I only see drops made to the Lens folder. This app used to be great for backing up photos, but not anymore. It’s slow and doesn’t upload them when it’s not open. It’s sad that I paid so much money for something that doesn’t work anymore. If backing up photos and videos is your primary purpose for using OneDrive you might want to look at some competing services. I love this app and it has even replaced dropbox, for me. The only thing, in my opinion, keeping it from garnering a Five Star rating is you cannot hide the top status/info bar. There should be an option in Settings allowing users to “auto hide“ it, rendering an unobstructed view while viewing documents, photos etc.- JUST LIKE DropBox DOES. OneDrive is awesome! My files are available everywhere! It accommodates device storage size, allows easy sharing of files with others and protects against ransom attacks. Microsoft updated to where we cannot copy files anymore, just move only! OneDrive app does not show all files. Through all app versions this goes unresolved. I have uninstalled and reinstalled which occasionally catches up to that moment, but to access files created beyond that time, would have to repeat. Not sure why a file management app does such a poor job managing files. Great app. However, I think it would greater if after you open a file it was possible to pass to the next file just by sliding instead of closing it in order to open the next file. The update says turn on One Drive shortcuts to enable "Hey Siri, scan a whiteboard" (or business card etc). So, One Drive shortcuts are enabled, but "Hey Siri, scan a whiteboard" produces the result, "I don't see an app called whiteboard". Scan a business card doesn't work either. Why tout features that simply do not work? I upload my lecture notes(ppt) to onedrive from school computers and use this app to read the notes on my ipad at home. Worked perfectly before the latest update. Now it takes forever to load any ppt file (less than 1M size) and when it finally does the ppts lost the original formatting and half the contents. Basically unusable now. Honestly, I don’t spend my time critiquing apps down to nuance. I think constantly tweaking an app makes it harder to use, not easier. Some of us just want to be productive, which means we keep things in the same place so we can find them. If you want your apps continuously tweaked I suggest using Google or Apple apps — sorry MS, you may not be everyone’s favorite but you are almost always functional and intuitive. If there’s anything you’d want most in a cloud storage/backup/sync service, it would be reliability. On that score, OneDrive fails in ways I’ve never experienced with Google Drive, Box or Dropbox (I use all 4). First, the iOS app constantly crashes. You open a directory to browse and it either crashes or fails to load. The bugs don’t stop there. Sort by date and for the most part it works, but there will be random files at the top (newest) that don’t belong, often more than a year old. Second, the app doesn’t sync in the background. You might think that you could use OneDrive instead of paying for iCloud to sync your photos. But with iCloud your photos always sync; no need to worry. 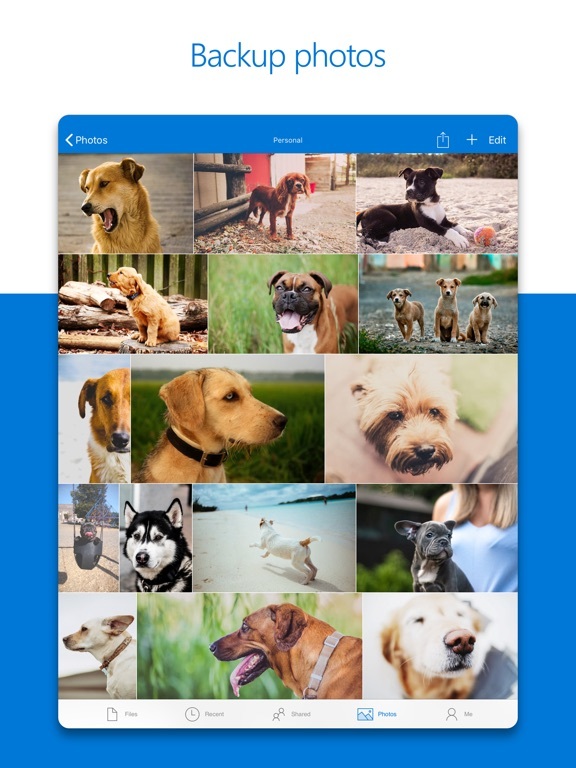 With OneDrive you have to open the app to the photos tab before they sync. So all those great photos you took on vacation you thought were automatically syncing weren’t. Finally, the Windows PC version suffers from the same unreliability. Random files don’t sync, especially Microsoft Visio files. The app will pause itself without warning, something you’ll only find out days later when an important file is out of date. You’ll put the icon in your always-visible taskbar icons to make sure you’re warned of issues, and on the next upgrade it reverts to hiding in the extra icons pulldown. Most of the time OneDrive works. But when it doesn’t, it won’t be expected, it won’t warn you, and you’ll be as frustrated as I am. Another company that’s trying to force you to buy storage. My account is frozen ,this is stupid. This app works well with all my other Microsoft products but you guys need to add a sort by type feature. So first, let me say that I pretty much use this app exclusively. It is easy to use and is very intuitive. IOS files and Dropbox, and even Google drive don't come close to how simple using this app is, even on the computer. So why the three star review? If there has been one glaring issue I've had with the app, it's the selection system. Good luck moving a large number of files around between folders or even uploading. The only way to select files or photos in the app is to do it individually by manually selecting each and every file, which becomes very time consuming and impractical when moving our uploading double or triple digits. Good luck of you don't have onedrive synced with a computer, because the only way to efficiently move files is to wait until you get to one, and if you skip one file by accident (and it will happen), have fun trying to find it in the mix. You'll probably spend more time trying to find it than you did trying to select everything. This is particularly troublesome when uploading files and photos as you won't know what you missed. So what's fix? Simply including a drag selection, like in the photos app, and even a select all would easily fix everything, and make selection feel as elegant and simple as the rest of the app. Like I said, I enjoy using onedrive, and hopefully Microsoft can fix this issue soon. I'll be sure to update my review when they do. Once I started using OneDrive to access my files on multiple devices, I was very satisfied and happy. This has been extremely helpful for me, and for sharing files with others. My frustration is trying to make sense of using OneDrive. It is not very user friendly on instructions. I had to cut files from my primary folders on my computer and paste them in folders on my desktop (or anywhere else), because I could not get the system to only save the files I wanted. You’re supposed to be able to choose which files go to OneDrive, but I still can’t get the system to do that so things like pictures and PDFs, which take a lot of space, have been moved out of My Pictures and My Documents. If you can make sense of how that works, you’ll probably fall in love with this for being able to access files. If you’re concerned about losing files, you can save them directly to OneDrive, as compared to having it on your computer. Good luck and enjoy. The most recent update is everything I hoped for. I stuck by OneDrive as they slowly made their way to full iOS support. The recent update takes it the rest of the way - it is outstanding. OneDrive for iOS is no longer a second class citizen. 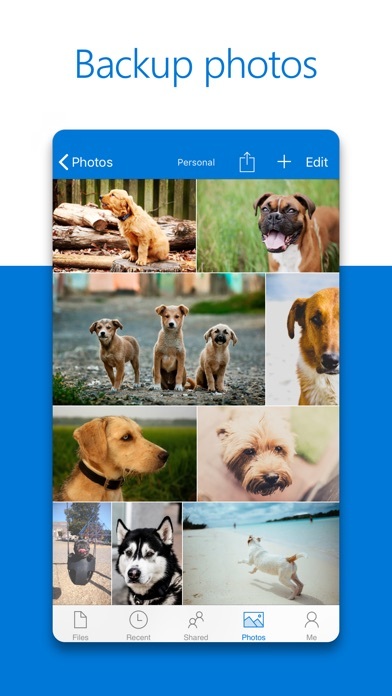 The OneDrive app is solid, with support for document previews, Live Photos, caching and better sorting. Drag and drop is also robust and well implemented. Don’t use it as much at the moment on my iPhone but found it pretty intuitive on the iPad. OneDrive is now also fully integrated in Files, if you prefer that. Surprisingly I’m now finding I prefer OneDrive app interface instead - better organization features than Files. Still, it’s nice to use files to throw apps between cloud services and local storage in a unified interface. The September 23, 2018 update says it is now organizing my camera roll folder by year and month. This is a great idea. This would be a better idea if it also organized the zillions of photos and videos in my camera roll that are not included because they were uploaded before the update. So unless this feature is gonna big to be included then please include the option to disable automatically sorting new photos and videos into folders like the website version of OneDrive has allowed for a few weeks now. I don’t want half of my camera roll organized and he other half a bloody mess, it’s all or nothing. If that feature is not going to be included then please also rerun the option of scrolling the button on the right up and down and automatically listing which month and year the photos and videos are from so I can still find stuff. I use two cloud services. I use the Apple iCloud for work (200GB), and the Microsoft One Drive for personal (1TB). I tried both in order to compare them to see which is better, and I think MSOD is the better of the two. What I especially like is the ease of uploading folders; however, I am surprised you can’t upload folders using Microsoft Internet Explorer. Strangely enough, you must use chrome. The MSOD is better syncing capabilities. I especially like how the MSOD app can be protected With biometric password access. iCloud does not have that, so my files on the iCloud service are more vulnerable. One advantage of the iCloud service is that you can buy smaller memory like 200 GB for $2.99/m, whereas MS sells 1 TB for $69/y, which is high, but it comes with Office 365. Both services should offer 500GB. I have purchased 365 Licenses for me and my family With which Microsoft offers one terabyte a onedrive, and I primarily use one drive to back up our pictures. I don’t usually write reviews but because I got very annoyed with one drive and it’s slow performance and many errors while managing pictures, I got fed up with it. Yes we have lot of pictures and duplicates, so I have been trying to consolidate them, but every time I try to do so, I get frustrated by onedrive’s perforamce. I try to select multiple file and delete. Not only it take a long time to refresh, and no my download upload internet speed is not slow , I have highest offered by bright House fiber optics. Too many times onedrive will freeze, that is she using a desktop, other it shuts down if I am using the app on my IPhone. Bottom line, I am disappointed the most because my expectations of a paid for MICROSOFT product to be close to perfect and this is exactly the opposite. I’m using a iPhone 6. I would always use this app to double backup my photos and other items I needed. Back then it use to be all in order. Didn’t need to scramble around to look for the picture or video. It would be in corespondent to the iPhones photo album. Now it’s just all over the place. I can have some pictures in order but some will be just not in the right spot. Making me scratch my head saying; did I really take it this date? Even as a OneDrive Premium customer, this has been going on for about 2-3 months now. I would hope that they bring this back. It works as it’s supposed to. Don’t get me wrong, but actually finding what I’m looking for at the time it’s supposed to be there. Not diving into a old box of photos figuring out when I took the picture. I miss that feature. I had downloaded offline content, about 7GB, not much. Turns out that after the last few updates, The OneDrive app doesn’t see the content and has to re-download the content again. This can be check my going to General-> iPhone/iPad Storage and looking for the OneDrive app. Clicking on each of the items previously downloaded brings up the circular bar that it’s downloading it. The purpose of offline content was so it could be available offline. This doesn’t help. At least if the info that was previously there is not going to be used, let the user know and wipe it out, that way we are aware and can download it in a place where WiFi is good, so when there’s the need to use it (in a Cell location where the signal is bad) at least we can have it available. Not sure if this is replacing the same content or just placing it as an addition download, in which case it’s double-dipping. I have been using Onedrive for a few months now (1TB). Everything used to work really nice. It was nice to have everything from my Xbox One, PC, and phone all synced up. FIXED -*Since I have upgraded my phone from an iPhone 6S to and iPhone X, I have been having crashing issues. I’ll start the app and it will load just fine. After a moment or two the app will freeze up and crash. I went to the MS troubleshooting page. It says to delete the app, restart the phone, and then redownload the app. I did all the steps. Still having the same issues. I’ll give the developer a week or so to come up with a solution, if there isn’t one in a timely manner, I will be canceling my subscription, and move onto another cloud service. If the app is fixed, I will review and edit my rating. Until then it’s a 1 Star. - FIXED Pros: Nice syncing for all of your devices. Pricing is not bad for the amount of storage you get. Cons: You can’t have more than one personal account synced. I’d like to be able to have my wife back up her phone to my storage, so that I wouldn’t need to purchase an entire cloud service for her. App is currently not usable, crashes upon start up. Great app. But one thing with update. Love this app. It is my favorite and I use almost all. The only thing with this new update is that it does not allow me to make minor changes to a file name. When I save my file and name them sometimes auto correct isn’t correct (as I do this through mobile dispositions mainly), and sometimes I don’t realize I may have missed a letter in the name. However, when I go and try to fix the name in my mobile devices I have to rewrite the entire name. I can’t just add or change where I need to. This is extremely annoying, before these updates I was able to make minor changes to tiles as necessary which makes it easier than having to completely type in an entire name again. I have an Ipad Pro recently issued new from my employer. I have a Microsoft 365 account through my employer and I’ve had a personal account for years. I’ve used the one drive app as well for years. However now with the 365 account I started to use the One Note app for both personal and business use. I use it across my iPhone, my iPad and my PC. The features of the App work great on my phone and my PC and even my older iPad2 but not my new iPad Pro. I cannot insert a file from OneNote as it doesn’t even show up as a location when I browse?? I’ve used the CHAT HELP on line and they switched over to an expert but then got a message that the business hours were over and I had to call back during business hours but it was 4:30 EST? This would be a great App if it worked with the insert file feature so that I could make up notes and photos and whatever?? You apparently can not auto upload pics from the camera roll to onedrive for business. This is stupid. Part of what I do at work is take pictures of random stuff that I need keep in onedrive for Business for things like evidence, etc. Microsoft seems to want me to put these evidence pics into a personal onedrive account...I’d get fired for doing that. Microsoft apparently wants me to get fired for evidence chain of custody/ethics/etc violations. Microsoft, this is not incentive for people to use your products. Microsoft, why do you care if ppl upload their camera roll to onedrive for business? So, I’m supposed to get my boss to give me the approval to pay for Dropbox Business subs for my whole team because it would allow us to work on a platform that would not violate various company policies because it would be done at the department level. Microsoft, this is crazy easy to fix, just allow people to auto upload the camera roll. Love Love Love MSOD app ! ! ! What on earth would I possibly due without my MSOD app? I WOULD be lost! I use it all the time! I own my own business so when i am sending files it makes it easy to convert files to pdf, word, etc.. and is easy to open the document in another app (like PDFfiller if I want to fax the document or something like that.) convenient and easy to use. They offer a ton of support if you need it. I have only two (smallish) complaints: 1.) when i am working on a document that i had uploaded to MSOD, & if i exit and then come back to it later to continue editing, the FONT will change from what i previously picked before-to-HELVITICA font. Then, i have to RE-EDIT the formatting for ALL the different sections that i had put any text in my document. Which is really odd & very annoying! 2.) when i am working on my document it will often just close out & any editing i had done will NOT saved, so if i was writing something and it just closed out, then everything that i had just done, would be LOST! It could be something in my settings for issue #1? But idk. Also my app is up to date. I use a iPad 5th Gen. I uploaded nearly 2k pictures. All were easily accessible and available for viewing. One random day 1,600 pics became unavailable. Not able to see them in the app, on the website, the desktop or the laptop. Not able to download and view. Every email I sent was returned with "we think you uploaded them incorrectly", followed by "you're using the old version of the app, you need to update it". Not true. Then it was "log off and log on". For what? And twice they've "escalated" the ticket. NOW, they're just ignoring me. They "escalated" my ticket on July 02, 2017, (for the second time) and they haven't said a word to me or responded to my emails since then. I'm angry but they obviously don't care that I trusted them with my pictures and they lost them. After asking them repeatedly THEY FINALLY RESPONDED LAST WEEK. They said “sorry, seems the files are corrupt, kindly upload them again”. WHATs THE POINT OF LOADING ANYTHING INTO THE CLOUD??? Have been using this app for accessing work email (exchange server) since last fall. Just like sitting in the office using Outlook on the network. Starting early February, the app began not logging into our mail server successfully even though the correct login info was being provided. We use MDM on our phones for encryption. I could attempt the login numerous times without locking out my network account indicating that Outlook wasn’t actually “knocking” at the n/w door. I had a week or two window of time when the app worked perfectly, then last week, the issue repeated intermittently. Currently it’s working. I’ve also placed a review for MDM. Our IT staff confirms all is and has been good with our exchange server. Onedrive is useful when it is working but it still feels like a pretty buggy app and is frustrating. Customer service is asking for screenshots I guess because they don’t believe my report. Screenshots sent this morning. Specifically, 1) sometimes Onedrive doesn’t even show as an option for transferring files 2) sometimes it only transfers some of a group of files but there is no notice and you don’t know which got sent 3) after starting a transfer, instead of a progress indication it says “waiting”. “Waiting” never proceeds. It is programmer-speak for “failed, you have to start all over.” If the progress ever says “waiting” save yourself time and just cancel and start over. As it stands, Onedrive is too unreliable for inclusion in any workflow. New update ruined this app!! The old version would have gotten a solid 4.5 stars. They had great inserts for pdf. documents utilizing text box, notes, and smooth writing ability of iPad. Now the new update has ruined the utility of this app on iPad. There is no more text box capability, the drawing and writing ability looks like it came from the 2000’s. To top it off the notes no longer are discrete and accessible when other edits have been made, and they take take up the entire page, which makes it hard to see additional notes and edits. This new update has ruined the utility and cleanliness of the application. They need to change it back to the old version or update it to something more 2018 status. With the fully integrated Microsoft Word and Excel with the OneDrive storage I love it! Easy to share, easy to access all files from any device, anywhere! I subscribed about 9 months ago and I no longer backup my files with external hard drives, or flash drives. Makes it so easy. Love having access to all of my files in my pocket, readily available. Game Changer! Stress reduced. I am amazed how fast everything is. Almost instant updates as others share files and edit documents. Ok, now to state what to improve next. Crop and rotate pictures! Also rotate videos. That should be the very next update. Come on Microsoft, that would earn you 6 out of 5 stars! I can see huge improvements since I last wrote my last reviews.. There are many refinements.. Offline feature is also supported but not so much convenient to use. It would be much better if you provide a feature that lets all file and folders be available offline once they've opened. This is so called smart-sync. We don't need another tab for offline files then. Each one can be indicated with a marked icon. Otherwise it's a decent cloud app across all of my devices. I would also like to see a photos app from Microsoft in the app store or a way to access my OneDrive photos inside iPhone Photos app. I used the editing feature with the Apple Pencil all the time it was very useful with all the different tools, the line/shape tool for example. Unfortunately the new updates decreased the tools available significantly. Including removing the line/shape tools, the weight of the free hand draw tool for the Apple Pencil and more. Not to mention it made writing with the Apple Pencil very unstable and shaky. Which was never an issue before. The latest update fixed this some what but no completely. I would like the old tool bar style back with all the old tools. I would recommend for storage of documents and other things. But would not current recommend for editing documents or adding signatures to documents until they resolve these issues. June 25, 2018 - BROKEN AGAIN App will not even start up. One day, maybe MS will hire some real programmers to repair the damage caused by the cheapest programmers. Time to go back to the Apple Cloud. I do not have near the trouble out of any other apps as I do this OneDrive app. It would be a great case study on why a company should never use the cheapest programmers for critical app development. Feb. 14, 2018 - AGAIN, you bozos broke the app. Do you not have it in your skillset to produce an update that doesn’t break things and disturb workflows? STOP using the public for your quality assurance testing. October 10, 2017 - again, the update broke the app. Again... August 25, 2017 -yep, today's update broke the app again. Dunces. August 2017 - the OneDrive app still proves to be a 1 star app. The continual updates prove to do as much harm as good. Finally got it connected again. Dreadfully slow uploads. Unimpressed. Great. The update today broke the photo sync. More incomplete testing before release. The photo sync needs to "set things up" at every start. Downgrading my rating. Here it is, July 2017, and you keep breaking the photo sync. GET YOURSELF TOGETHER! Dang, the app won't "function" for more than a few hours at a time.. Oh, I now have photos in my collection that are not mine. This app is very good. Some fixes that would be nice is that when you are uploading to OneDrive and have to click the “upload OneDrive” link, it sits right on top of the iPhone X slider. So you have to be very precise to get it to actually activate. If it were just a little higher would make it much easier to upload. Second, really like the new scan feature. Saves some steps if you have other 3rd party scan apps. However after you edit the name of the file it won’t allow you to select where to upload it to. Such as a specific folder. That’s annoying. So you have to find it, then move it to the right place. Other than that it’s great. 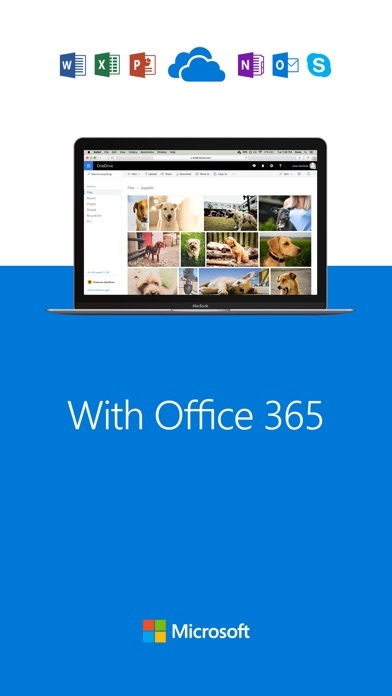 I use OneDrive solely because I subscribe to Office 365 (which is generally great on the iPad). The service works well, and I have had no serious issues with lost data or syncing. There are a number of things that need to be improved to make this fully functional on an iPad: - Support for iOS Files app: Currently, this is half-baked and not fully implemented. You can open OneDrive in the Files app, but it only works as a pop-up (similar to share sheet pop-ups). It does not have the full integration that Dropbox does. - Drag and drop: Microsoft apps do not play well with drag and drop on the iPad. Instead, a long press opens up the selection tool. Drag and drop is one of the most useful features on the iPad for making it function as a laptop replacement. This is key! - View options in the app: The three column view in list format makes it impossible to view full file titles unless you use very short names. It would be much easier to view in a two or one column format. Additionally, it would be helpful to view folder structure (e.g. using drop down actions) rather than having to click into each folder to view contents. I wanted to use OneDrive to collect all the photos from 46 different people that recently went on an overseas tour as a group and make these photos available to all 46 people (everyone has access to everyone’s’ photos). However, unless I force all of them to create a OneDrive account, they cannot upload their photos to a folder that I planned to share with them. I had to select a competing cloud service that did offer this capability using a request for files feature. This capability is a must have for any complete cloud solution. I want OneDrive to be my singular OnePlace to do all of my file backup, sharing, and collaboration tasks. But it’s not there ‘yet’. Microsoft please add this capability. This login issue has been going on for a while. It’s so inconvenient with this app. My employer started using the share point and at first, this was an awesome idea because customers could still get into the one drive to access what was needed on the go. From the past few months this app has been just taking up space, I can’t use it to move my own personal things tonight for my home life and I cannot use it for the work intended purpose either. The app just updated today saying that the bugs were fixed with the login issue but yet it still remains an issue. I started using OneDrive last year and love it. It works seamlessly between different gadgets, iOS PC etc. The mobile application is outstanding. The only annoying thing is that when I scroll by swiping up, I sometimes accidentally drag and drop files into folders by accident and I am not sure how to undo my last move when I do that, and it doesn’t ask for a confirmation about the move. Also sometimes I have minor issues with instantaneous syncing from the PC if the battery had been drained or if it was in sleep. But the positives attributes are outstanding. Highly recommended. I’ve used OneDrive for a couple of years and it’s indispensable to keep everything available to me regardless of the device I’m on. My only complaint is the “scan” feature. I just want a document scanner, with a default to B&W and easier cropping ability. The ability to adjust the save size of the PDF would be useful as well (big for dosimeters with photos, small for text). I have to deal with a lot of documents at work and typically use Genius Scan. I have tried to use the OneDrive and Office Lens scanning features but find Genius Scan easier. Microsoft has a lot of money...just buy them out and fold their tech into the OneDrive scan feature. The main use I have for OneDrive is to take notes for school. Professors post the lecture notes online, I then download them to OneDrive and when class time comes I use OneDrive’s TextBox feature to type and fill in my notes. Yesterday I made the mistake of updating the app and to my surprise (during class) the text box option is nowhere to be found. I scoured the app for 40 minutes all while my lecture was going on and I missed important information trying to figure out something in an app that I used to consider reliable. I do not have a laptop. I do everything on my iPad Pro, it fits my needs. Finally I gave up and transferred my file to Adobe and continued to fill my notes without a issue. Please fix this I need the text box I need to be able to type in and fill my information in on my pdf on my iPad . This used to be an ok app, especially good for PDF annotations with an iPad Pro and Apple Pencil. Now with his update, the annotations bar takes up double the space, both on top and bottom, the pen size doesn't allow half sizes anymore, the writing for whatever reason is very degraded in quality and is very shaky looking, and most disappointing, the ERASER app that used to be able to erase fine detail is now a crappy strike through eraser that erases everything you drew on the page if you try and erase anything. In addition, the app used to remember what size and colorimeter used to edit my PDFs but now resorts to a default every time I open a PDF. Please please please bring the old annotations tools back, this is a horrible horrible updated people like me that rely on this app in school (especially professional school) for note taking. Please stop adding new features no one needs until you fix syncing. OneDrive is by far the worst cloud storage option when it comes to slow, buggy syncing. It once took over 2 hours to sync a single PDF. It just sits there spinning saying “syncing”. I have a 1 Gbps connection. It’s just unacceptable. I’ve reinstalled multiple times and tried just about every fix I could find. The problem is on YOUR end. It’s gotten so bad that I can’t even rely on it anymore. I even missed a few deadlines because I couldn’t access my files - AND IM A PRO USER. While you’re at it, fix OneNote. Literally haven’t been able to use it once on my MacBook. I have OneDrive installed, but no matter how many times I reinstall, it says “Problem setting up OneNote” and has me click a button to close and fix it, which of course does nothing. Why can’t Microsoft get this right? OneDrive has never, since the moment it began “supporting” it, ever played nice with iOS Share Sheets. If you find a file in Safari you want to copy to your OneDrive, you’d tap the Share button, hit OneDrive, and about one in three times it would successfully upload. Now that they “support” Files (about 8 months after Dropbox did, mind you), you can tap “Save to Files” instead, navigate rather fluidly to where you want to save the file, and then viola! —it still fails, but it fails marginally faster now. Then, when you navigate to OneDrive via Files, the file you attempted to upload will have a helpful “Upload Failed” notice under it, with no way to reupload it manually. 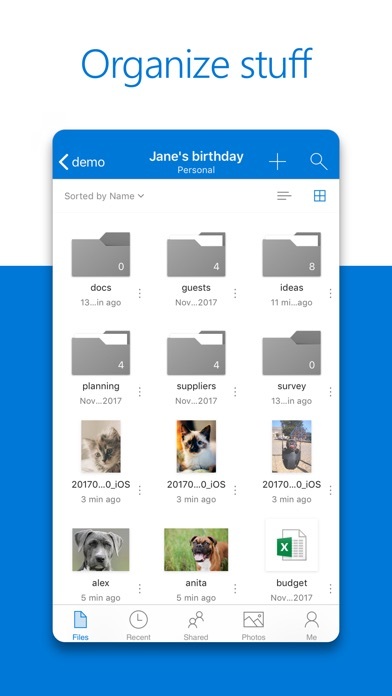 And of course the OneDrive app itself will show the file in its proper place, but you won’t be able to open it, because it never uploaded to the cloud because Microsoft has no earthly idea how to accept uploads from iOS Share Sheets like literally every single other cloud service has done, perfectly, for years. Does Microsoft’s team even test these features when it rolls them out? Do any of them use iPhones in their daily life so they understand how users use them? What is so bloody hard about this? I have been using One drive for business with 12 of my employees. It works great for all devises. These are outside reps that need to view and edit shared files. The one continual problem is that One Drive allows multiple people to edit a file at the same time. When one users closes the app, the system doesn’t know what to save, do it creates a second file. Now, I have multiple files with different info. This system should work the same as other Microsoft apps, where when a file is open, no other set can edit. It opens as a read only file until the other user is finished. Great app, but this is killing it!! I love OneDrive! I have it on ALL my devices and they all automatically upload photos to the OneDrive cloud. I like is so much better than any other cloud system I’ve tried (iCloud, Google Drive, Drop Box). I just need ONE thing on my iPhone... the ability to upload to the cloud when the phone is locked! Please! I want my phone to be locked, though it seems to only upload photos when it’s unlocked. This leads me to have to go into settings and physically set it to stay unlocked every few days so my photos can backup. Please fix this. It should be able to work in the background even when the phone is locked. Use the app a lot and I’m no longer happy with where it is at after a few recent updates. Mainly, I use the video section. When I go to the video section now after uploading a new video, I CANNOT FIND IT!!! There used to be info under the videos and they also used to be placed in the app in some kind of order. Now, I uploaded my last video 4 or 5 times before I could even find it and I only had about 40 videos. Why would you remove the video info and why are the videos no longer going in, in some kind of order? It keeps putting new uploads in the middle of everything with no info and it doesn’t make any sense. Is it an accident? Is it going to be fixed? HELP! Please! The uploading and downloading, file sorting, and other features work well and I think the app is great. There are just a couple things that could be added to make it better: 1. Slide/Swipe to select items. It’s a bit cumbersome to individually tap each item for uploading when you’re uploading in bulk. 2. Context menu for progress. Just like the Windows Phone version, this would be very useful. There’s an issue where if I upload new items while others are still in the process of uploading that the progress page disappears and I can’t see how far along everything is until it’s all finished. When you have apps that update more often than you use them, it’s a sign you might not really need them. IOutlook ans OneDrive have updates like every other day. I spend much more time updating those apps than actually using them. Might switch to less demanding apps updatewise because it’s a pure waste of time. Rarely there are new features to the apps. Outlook looks the same at least for the last 6 months, but has been updated at least 50-60 times in that same period. It’s 7-8 GB of data for nothing, just for one app. Where’s the reason Microsoft? Quit pushing 150MB updates every other day, push it once in 2 weeks, I promise you we will be thanful for not waiting our nerves, time and data plans. After deciding to renew my Office 365 subscription to get the 1Tb of storage in OneDrive through iTunes, I noticed after 2 months that I never received the content although I had paid for it. I sent Microsoft a message and after two days of going back and forth and finally “talking” through the chat service (after the first chat person disconnected from me), I was told to contact Apple since I had gone through a “third party”. Apple resolved the problem by refunding the 2 months I paid for without receiving the content within 5 minutes and the rep, Lyn, was so chat friendly. Microsoft has ALWAYS been and ALWAYS will be a crappy customer service company, but thanks for treating me so horribly that I decided to buy more iCloud storage instead! I’m done with giving my money to ingrates. I needed a solution for having offline access to travel documents already organized in folders. iCloud only allows saving in one of three apps. But a document saved in Numbers, for example, cannot be opened in Numbers- it can only be opened in Files, which cannot be organized into folders. With OneDrive I can designate files to be available offline. The document is then accessible without looking any place else. This is substantially more intuitive and easy than any other method I’ve tried. 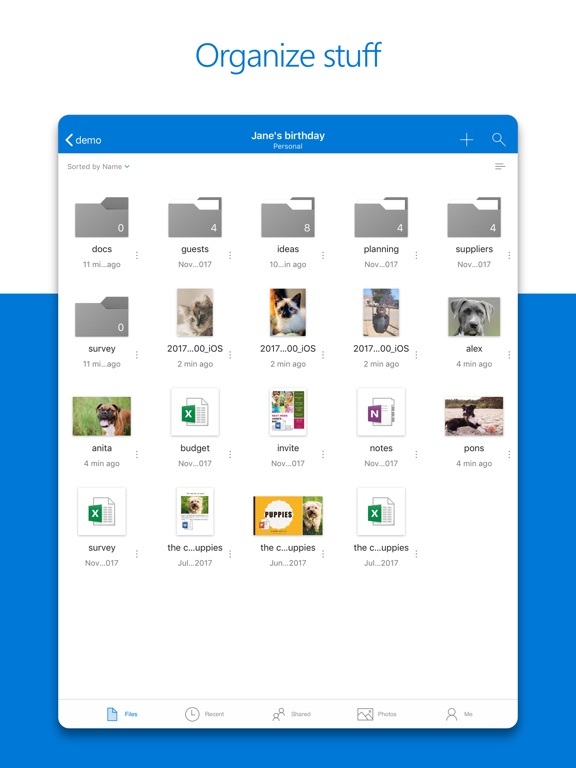 For my intents and purposes, the OneDrive app is great for storage and accessibility and I love the amount of space that’s available to me, which is the key reason I prefer it over Dropbox. With that said, it can certainly use some Dropbox-style improvements to enhance navigation and organization, and there’s a bizarre and on-going frustration that is once again plaguing me after I installed the app’s latest updates: my GIF files all appear upside down. I encountered this problem earlier this year; after logging off and re-installing the app to no avail, the issue was corrected with a subsequent update. To have this problem happen again is irritating to say the least. This is a dynamic necessity(but always have a backup,) it is really great at integrating with everything else as well as and every other stormy “cloud” out there storing the “IoM” I figure that a company owned by the public, and created by a CEO that spends most of his time doing Millions of dollars of chairing work either did something really bad that he needs to repent, or he’s a really great person As he seems to respect data privacy more than most even in the agreements as unlike other platforms, I don’t need an attorney to read their privacy statements. I have never paid for this... It was on my computer when I bought it and decided to use for storage for my pictures!!! I don't want to lose my pictures on one drive but I was never informed that it cost anything... I haven't paid at any time for this... Please help me understand what is going on!!! Or is this a scam??? I am ALWAYS weary of such notices!!! Please don't delete my pictures and keep one drive if there is no charge.. I only get SS and am on a tight budget!!! I don't understand this message!!! Your help would be appreciated!nnthat is my nickname am I mixed up with someone else???? Best thing I ever added to my pc Works flawlessly ! A phone tech helped me hook it up and I have never looked back it’s like having a huge backup drive that will never fail. All my files are available to me on all my devices and they are always up to date! The files are the ones I am working on the exist on my computer but are instantly backed up. I go to my OneDrive to open everything it’s just like having a huge hard drive file on me desktop that stores everything, and then backs up everything!! I’ve used onedrive for years to transfer Xbox clips to the app to view and save to my phone. I pay monthly for extra storage but the past couple months only half of my videos show up in the app. It crashes often. They are all out of order. Some are completely missing. I can view on the web browser but it’s time consuming. The app used to work so well :( I tried to contact customer support and they never followed up. I made sure my phone and app were up to date. Have reinstalled multiple times with the same issues each time. I was hoping it’d work again once switching to iPhone 8plus but same issues. The app is useless to me now and i rarely use the web browser because it takes so long. So disappointed. After taking out the Home subscription, OneDrive is quickly becoming my hub for all my files. Integration wit Word, Powerpoint etc is flawless. Sending a link is easy. A few improvements may be in order: - Drag and drop in iOS 11 is not working yet. Would be very handy for email. - after sending a file to onedrive from another app, the Recent Files list does not show it (either it does not update at all or not soon enough, I have not used this long enough to know) - is copying or duplicating a file possible? I only found the move function thus far.